Ant. 1 Jacob became the father of Joseph, the husband of Mary. She gave birth to Jesus who is called Christ. to a virgin betrothed to a man named Joseph. she was found to be with child through the power of the Holy Spirit. since you know full well that you will receive an inheritance from him as your reward. Be slaves of Christ the Lord. and to unite our personal prayer more closely with the word of God and public voice of the Church. Ant. This is the faithful and prudent steward whom the Lord has set over his household. – Our Father in heaven, hear our prayer. deepen our understanding of your Son, true God and true man. give all your children their daily bread, to sustain soul and body. may all who work receive a just reward for their labors. 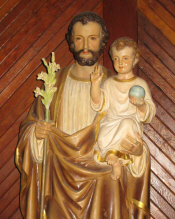 may Saint Joseph inspire us to walk always in your way of holiness. through the intercession of Jesus, Mary and Joseph. -And my mouth will proclaim your praise. Ant. Let us praise Christ the Lord as we celebrate the feast of Saint Joseph. she will give birth to a son, and you will name him Jesus. Your saving help has given him glory. you have granted your blessings to him for ever. and took Mary as his wife. they are doomed to be eternally destroyed. called Bethlehem to register with Mary. – He shall flourish for ever in the courts of our God. Faith is confident assurance concerning what we hope for, and conviction about things we do not see. and that what is visible came into being through the invisible. God himself having borne witness to him on account of his gifts; therefore, although Abel is dead, he still speaks. Scripture testifies that, before he was taken up, he was pleasing to Godbut without faith, it is impossible to please him. Anyone who comes to God must believe that he exists, and that he rewards those who seek him. By faith Noah, warned about things not yet seen, revered God and built an ark that his household might be saved. He thereby condemned the world and inherited the justice which comes through faith. whose designer and maker is God. who was himself as good as dead, descendants as numerous as the stars in the sky and the sands of the seashore. All of these died in faith. They did not obtain what had been promised but saw and saluted it from afar. By acknowledging themselves to be strangers and foreigners on the earth, they showed that they were seeking a homeland. If they had been thinking back to the place from which they had come, they would have had the opportunity of returning there. or he has prepared a city for them. He never doubted God’s promise but was strengthened in his faith and gave glory to God. – Therefore through faith he was counted as justified. Faith was at work in his deeds, and by his deeds his faith became perfect. with all the gifts of the Spirit needed to fulfill the task at hand. saying: Good and faithful servant enter into the joy of your Lord. and reverence to Saint Joseph. In him the Old Testament finds its fitting close. He brought the noble line of patriarchs and prophets to its promised fulfillment. What the divine goodness had offered as a promise to them, he held in his arms. as a son to his father. Rather we must say that in heaven Christ completes and perfects all that he gave at Nazareth. the Lord preferred to say to Joseph: Enter into joy. His intention was that the words should have a hidden spiritual meaning for us. They convey not only that this holy man possesses an inward joy, but also that it surrounds him and engulfs him like an infinite abyss. the Father and the Holy Spirit lives and reigns eternally. Amen. God has made me a father to the king and master of all his household. – He has raised me up, that he might save many people. The Lord is my helper and protector; he is my savior. marveled at what was said of their child, and Simeon blessed them. here they stayed until the death of Herod. Ant. 3 Joseph rose in the night and took the child and his mother into Egypt. There they stayed until the death of Herod. Lord God, you are God and your words are truth; you have made this generous promise to your servant. and by your blessing the house of your servant shall be blessed forever. had foretold of Christ: He will be called a Nazarean. listening to them and asking them questions. You have come to Mount Zion, to the city of the living God (Hebrews 12:22). Ant. 2 The mother of Jesus said to him: Son, why have you done this to us? See how your father and I have been anxiously searching for you. there he lived and was obedient to them. and worship in your presence. since you know full well that you will receive an inheritance from him as your reward. Be slaves of Christ the Lord. and was thought to be the son of Joseph. to the care of Saint Joseph.